This page will walk through Angular Email validation example. We can validate email using EmailValidator and PatternValidator directive. EmailValidator provides in-built email validation. PatternValidator uses regex to validate email. So we can use PatternValidator for custom email validation. For EmailValidator we need to use email attribute in controls such as text input and use Validators.email in FormControl while creating FormGroup. For PatternValidator we need to use pattern attribute in controls such as input text and use Validators.pattern in FormControl while creating FormGroup. Angular 4 uses novalidate attribute by default in its form element at run time and hence while submitting form, HTML 5 validation will not work. If we are using Angular 2, we need to write novalidate attribute in our form element to use Angular form validation. In Angular 4 template-driven form we can use ngNoForm to enable HTML 5 validation. Here in our example we will provide demo for Template-driven form as well as Reactive form for Angular email validation. Now find the complete example step by step. Angular provides EmailValidator directive to validate email. We need to add email attribute in controls such as text input and use Validators.email in FormControl while creating FormGroup. We will provide how to validate email with EmailValidator using Reactive form and Template-driven form. We need to use Validators.email for email validation while creating FormGroup. We can also add validation at run time as following. Find the code snippet of HTML template. Now to display validation error message we will create a getter method. We can display validation error message as following. In the same way we can display error message for secondaryEmail. We can also validate email using email attribute with formControlName. If we want to enable/disable email validation at run time, we can use email property binding. Suppose we have a property in component as following. Now use property binding as following. In Template-driven form we need to use email attribute with ngModel in controls. Find the sample code. We can also use email attribute as following. We can enable/disable email validation at run time. Suppose we have a component property. Now we can use email property binding as following. Email can be validated using Angular PatternValidator directive with a regex. If pattern does not match, we will get validation error. In this way we can define custom email validation. For PatternValidator we need to use pattern attribute with ngModel, formControl, formControlName. We need to use Validators.pattern while creating FormGroup and pass regex for email validation. 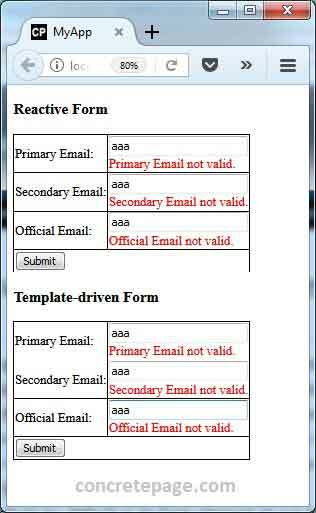 Now we will provide email validation for Template-driven form as well as Reactive form using Angular PatternValidator directive. We will use Validators.pattern while creating FormGroup. Find the regex for email. Find the code snippet in HTML template. To display validation error message, we will create getter as following. Now display validation error message. Pattern validation can also be used with formControlName with pattern attribute. Find the code snippet. In Template-driven form, we need to use pattern attribute with ngModel. Suppose we have a component property that is defining regex as following. In HTML template, we will use pattern attribute as following. Display validation error message as following. When we click on submit button, we will get following output.